Now Accepting 2017 Christmas Wreath Orders - SAVE 10% - Plus FREE Shipping! Hurry! 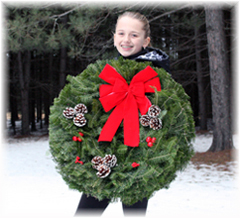 Last Chance to Order Fresh Balsam Christmas Wreaths! Only 2 WEEKS REMAIN to send a holiday tradition to yourself, family, or friends! Our fragrant, hand-crafted wreaths are quickly disappearing and our last ship date, DECEMBER 15th, is fast approaching. FREE DELIVERY! All Christmas Wreaths are 10% off!